The central narrative of Star Trek: The Motion Picture is clever and fascinating (and, as some may rightly insist, highly reminiscent of various episodes of the TV series). Sometime in the 23rd century, a massive, mysterious space cloud passes through the boundaries of Klingon territory and destroys three battlecruisers while assuming a direct heading to Earth. By contrast, Robert Wise directed the technological thriller, The Andromeda Strain (1971), based on the best-selling Michael Crichton (1942-2008) novel about an alien organism (or germ...) threatening all human life on Earth. Wi se once stated that The Andromeda Strain concerned "the first crisis of the space age," a descriptor which permits us to see Star Trek: The Motion Picture as a further meditation on a similar theme, only representing a (much) later planetary crisis, only in the 23rd century. Most uniquely, however, the The Andromeda Strain's climax concerned the pitfalls of technology: a teletype/printer experienced an unnoticed paper jam at a very inopportune moment. Some critics and film scholars have interpreted this malfunction as Wise's explicit warning about relying too heavily on technology, but the opposite was true. Had the pri nter worked as planned, one of the scientists would have transmitted orders for a nuclear bomb detonation at an infected site, a course of action that would have catalyzed and spread the Andromeda germ. C onsider for a moment just how many times Star Trek: The Motion Picture lingers upon the important act of a man entering -- or connecting to -- a machine. We watch Kirk's shuttle pod "dock" with Enterprise after a long, lingering examination of the ship. We see Spock, in a thruster suit, "penetrate" -- in his words, "the orifice" leading to the next interior "chamber" of V'Ger. This terminology sounds very biological, doesn't it? Consider that Spock next mentally-joins with V'Ger, utilizing a Vulcan mind-meld, yet another form of symbiosis. 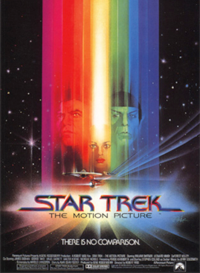 Despite protestations to the contrary, Star Trek: The Motion Picture is a movie intrinsically, nay organically, about character, and character development. 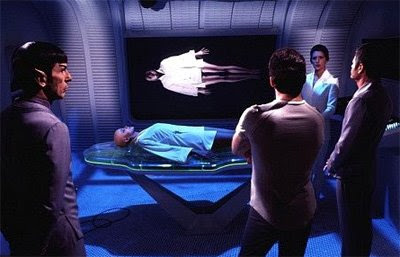 In simple terms, the film's main characters (Kirk, Spock and Decker) serve as the deliverer of human ideals to the cold, empty V'Ger child so that it may "evolve." But in doing so, they also bring along a lot of "foolish human emotions," as Dr. McCoy asserts at the film's conclusion. And to some extent, the Enterprise (Kirk's other half, or perhaps a representation of his id...) rebels against this egomaniacal version of Kirk. Consider how much goes wrong on Enterprise when Kirk is acting in this selfish mode. The transporters break down, killing two new crewmembers. Kirk gets lost on his own ship and is discovered (in an embarrassing moment) by Decker, the very man he replaced. 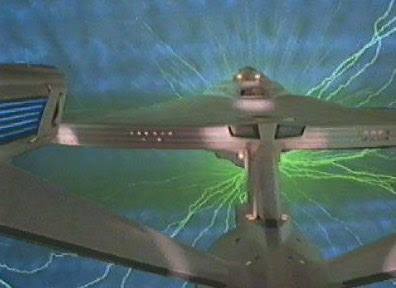 Kirk "pushes" his people too hard, forcing the Enterprise into warp speed before it is ready, and in the process nearly destroys the ship in a wormhole. He does so over the objections of Mr. Scott, Captain Decker and even Dr. McCoy. This Kirk is all ego and selfishness, until he remembers the key to commanding the Enterprise: listening to all viewpoints and making informed decisions. This also happens to be the key in any male/female relationship. Just treat her like a lady, Jim, and she'll always bring you home. This first Kirk is too hungry, too grasping, too desperate to "re-connect" with the Enterprise in anything but a physical way. Bones puts Kirk in his place, but all the malfunctions of the Enterprise subtly (and symbolically) perform the same function. Although Spock is only half-human, he undertakes much the same journey as Kirk in the film. He returns to Starfleet because he has failed to purge himself of human emotion and believes that an understanding of V'Ger will lead him to that destination. McCoy fears that Spock -- like Kirk -- will put his own personal interests ahead of the ship's. What Spock ultimately learns from his encounter (mind-meld) with V'Ger is life changing for him. He discovers that V'Ger has achieved what he seeks, "total logic." But damningly, "total logic" doesn't make V'Ger happy. Thought patterns of "exactingly perfect order" don't leave room for belief (in the afterlife...), for the "simple feeling" of friendship Spock feels towards Kirk, or much else. There seems to be this weird belief among many fans that Star Trek: The Motion Picture doesn't represent the best of Star Trek. While it is easy to see that the film doesn't accent the humorous side of the Star Trek equation, The Wise film does get so many things right. 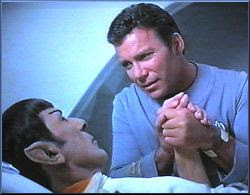 Most importantly, it captures the Kirk/Spock friendship in simple, poignant terms (in a scene set in sickbay). Imagine how easy it would have been for Gene Roddenberry -- just two years after Star Wars -- to cowtow to public opinion and make a huge, empty action film with laser blasts and spaceships performing barrel rolls. No one would have blamed him. I'll bet you a lot of fans would have liked that story better. I always loved this movie. Now I want to watch it again. Thanks for the excellent, thoughtful review, John. Thanks, John! It's always great to hear from you. I enjoyed this review, especially the commentary about The Andromeda Strain, one of my favorite movies. Yes, John, you've got it! This is the STAR TREK film that tried for something greater, something with meaning, something beyond being an entertaining shoot-em-up action-adventure film. Everything you point out above is why this is my favorite STAR TREK film and why I've been defending it for going on thirty years, now. The first conversation I had with the woman who bacame my wife was an in-depth analysis/defense of this film 25 years ago on our first day at Uni. Just last week, we watched the Director's Edition (I re-watched and she joined me for I think her first in-depth watching of the DVD) and again we had a long and involved conversation about this film being the only filmed example of seventies TREK (outside of The Animated Series) and the '70's ethos of the peaceful uses of science and technology and the mind-expanding nature of literary science fiction of that period, in contrast with the more militaristic, action-orientation and sentimentality of Reagan-era Meyer/Bennett style TREK. Digression aside, and getting back to your post. Everything you say above is why I am skeptical of JJ Abrams' revamp and revisioning of the concept. 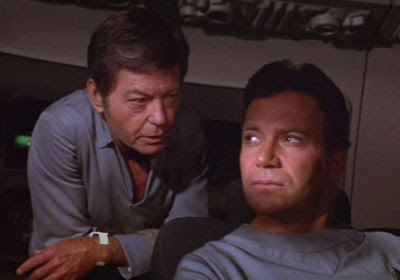 "Ster-Oxy-G" sounds like it should be the name of one of the substances in Dr. McCoy's spray-hypo. Well, starting with the seed planted by this review, my wife, mother-in-law and I have been semi-marathonning the Trek films. It's really striking to see them in rapid succession like this. We watched the reviled Part V last night ... and it was nowhere near as bad as I remembered it being. Oh sure, it was BAD and all ... but there was a lot of cool stuff that my memory had covered up with all the bad. JKM, have you considered blogging more Trek films in this summer of the Enterprise's return? 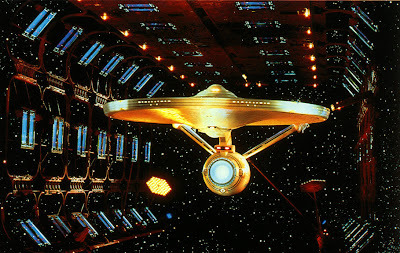 Yes, I will be blogging more Star Trek films, perhaps even Star Trek V! Outstanding review. I've always liked Star Trek: The Motion Picture for many of the reasons that you have clearly elucidated here. 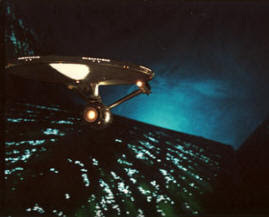 Perhaps one of the only other times that Star Trek reached such a spiritual catharsis was at the very end of the Next Generation finale, "All Good Things," when Q tells Picard that the human future isn't going to be about mapping star clusters and nebulae, but about charting the unknown possibilities of existence. Wow, great blog on this under appreciated film. I've always enjoyed this installment, and I will be the first to admit that a lot of it is nostalgia, I also think that the movie is actually the most epic of the series. It is filled with the wonder and awe of space travel, something none of the other movies ever captured. Anyway, it was great to read an in depth review of the film. You don't see enough of them out there. Roman: Thank you for the kind words regarding my review for ST: TMP. I agree with you about the film's sense of wonder and awe, and the thrill of encountering something new and unknown. As much as I love all the Star Trek movies, this is the one -- as you say -- that deserves the descriptor, epic. John, as always another outstanding review. No matter what some fans have said, I truly appreciate and enjoy TMP and its spiritual overtones. 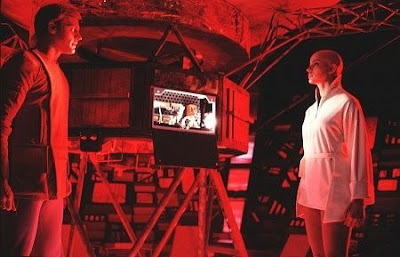 Even the cold, icy, sterile, monochromatic, antiseptic edge of the film is beautiful in terms of the sets and the uniforms. I even like th film more, after having viewed Robert Wise's Director's Edition, because it is shaped and molded in the way that Wise originally envisioned the film. 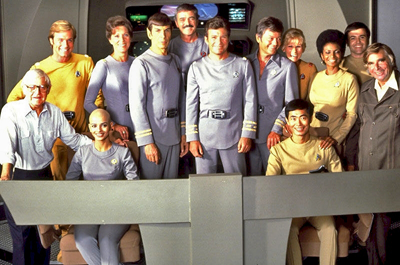 Star Trek-The Motion Picture maybe polarized, but one thing is absolutely certain. It is epic and cinematic in scope, and it did start the film series. Four Years on the Blogosphere (So Far...)! The Secret Coda of The House Between? The House Between 3.6: "Resolved"